Born: 1794 in Sandwich Ma. 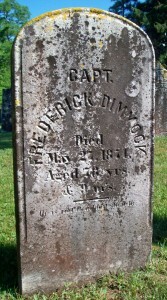 Died: May 27, 1874 in Sandwich Ma. at 78 yrs, 9 mos. 1. Rebecca H. Dimmick Turner; (August 18, 1824 – ? ); Married Joseph H. Turner (1817 – 1893) (Japheth Turner & Susan Fish) in Sandwich Ma. on October 7, 1842; Joseph is buried in Cataumet Cemetery. 2. Nancy Bassett Dimmick Perry; (August 20, 1827 – April 13, 1895); Married Mordecai Ellis Perry (1824 – 1908) (Silas Perry & Rebecca Ellis) in int. September 1, 1846; Modecai married (2) Delphina/Adella E. (Crocket) Skillings (? – 1908) on August 28, 1897. Married (2); August 27, 1829 in Sandwich Ma. 1. 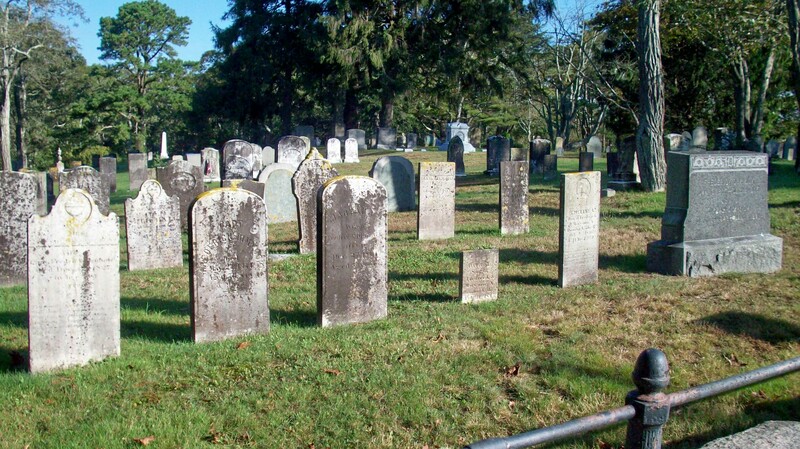 Rhoda Ann Dimmick Burgess Howard; (July 30, 1831 – April 28, 1907); Married (1) Henry Burgess (William Burgess & Mary (–)) & married (2) Ezra Coleman Howard (1831 – 1885) (Calvin Howard & Hannah Handy) in Sandwich Ma. 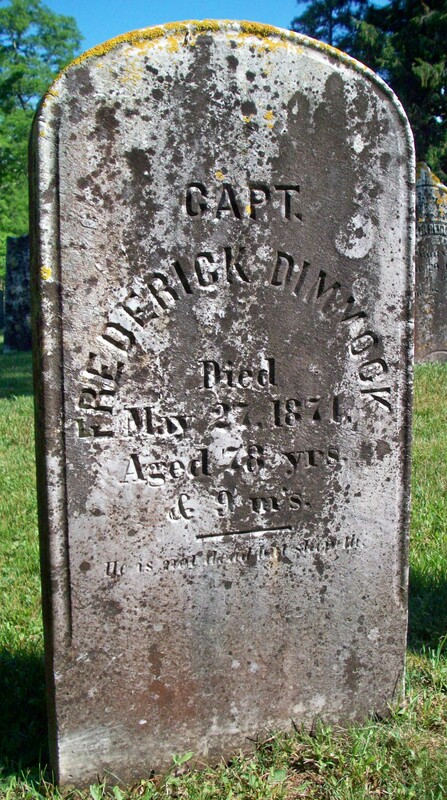 on June 25, 1876; Ezra married (1) Rhoda’s sister, Caroline S. Dimmick (1834 – 1874) (Frederick Dimmock, Capt. & Maryann N. Lawrence) in int. 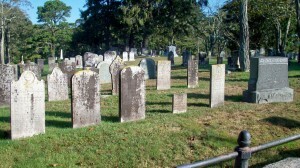 November 19, 1856; Rhoda, Ezra & Caroline are buried together in Cataumet Cemetery. 2. Emeline L. Dimmick; (September 8, 1832 – October 2, 1846); Emeline died at 14 yrs, 22d. & is buried in Cataumet Cemetery. 3. Caroline S. Dimmick Howard; (June 28, 1834 – August 22, 1874); Married Ezra Coleman Howard (1831 – 1885) (Calvin Howard & Hannah Handy) in int. November 19, 1856; Ezra married (2) Caroline’s sister, Rhoda Ann Dimmick (1831 – 1907) (Frederick Dimmock, Capt. & Maryann N. Lawrence) in Sandwich Ma. on June 25, 1876; Caroline, Ezra & Rhoda are buried together in Cataumet Cemetery. 4. Frederick Dimmick, Jr.; (January 19, 1837 – December 12, 1905); Married (1) Tirzah Hatch (1843 – 1891) (Vinal Nye Hatch & Martha Eldred (Swift)) in Falmouth Ma. on May 17, 1866 & married (2) Laura Jane Gower (Abt.1854 – ?) (Davis N. Gower & Susan Hawes) in Boston Ma. on September 23, 1899; Frederick, Jr. & Tirzah are buried in Cataumet Cemetery. 5. Joseph Owen Dimmick; (December 19, 1841 – 1921); Married Selina Frances Slater (1843 – 1924) (Benjamin Franklin Slater & Selina Garrett Williston) in Sandwich Ma. on February 27, 1872; They lived in Los Angeles Ca. & Denver Co.; Joseph & Selina are buried in Fairmount Cemetery in Denver Co..
6. David L. Dimmick; (April 1, 1843 – February 21, 1845); David died at 1 yr, 10 mos, 10 d. & is buried in Cataumet Cemetery.